Foshan Tianxiang Sporting Goods Co.,Ltd. After decade of endeavors, our company has cultivated a group of diligent young staff and found out a set of efficient production for motorcycle helmets. These are the foundation for our high quality products. Since its establishment, Fushi always keeps the mission of“innovation and quality first”, and the goal of “keeping rapid growth and striving for perfection”to get the recognition and trust of the customers. 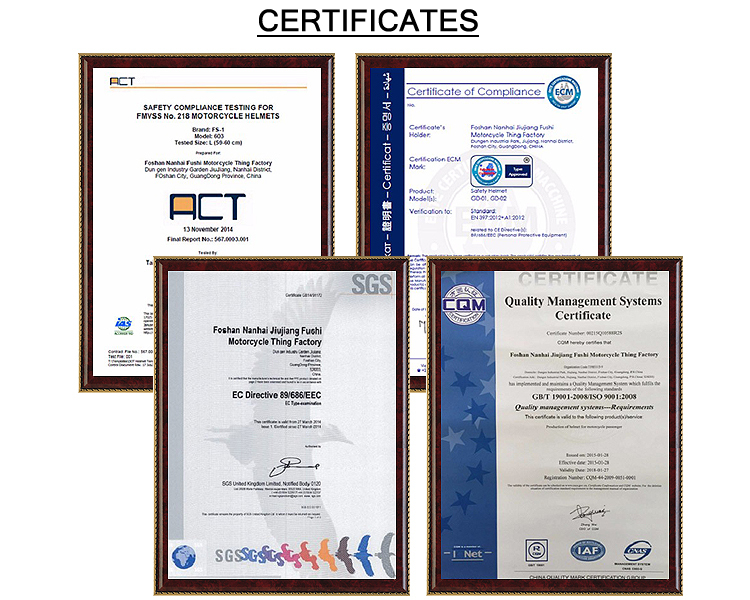 In 2006, our company acquired the certificate of ISO 9001:2000 quality management system. And in 2008, we introduced the advanced helmet testing equipment which has effectively improved the quality of our products. With the spirit of “honesty and practice”, we hope to offer every motorcyclist with safe and comfortable helmet. Recently, many of our helmet products have reached the safety standards of D.O.T(U.S.A),GB811-2010 (China), PSB (Singapore), KPS (South Korea), NBR (Brazil), NIS (Nigeria), etc.. With the stable high quality and continuous innovation, Fushi has gotten the recognition and approvement in both domestic and oversea markets.